So often, translated children's books come off as beautiful, but stilted or odd, most certainly having lost something in the translation. Happily, that is not the case with this French import. Each page features an exploration of the season at hand, whether by smell, taste, feel, sight or sound. Spring offers green colors, beautiful smells of budding flowers, and the tickle of a ladybug. Summer brings fireflies, the smell of tomato and basil, verbena and mint, the sound of a summer thunder storm, and a day at the beach. Autumn features the smells of moss, mushrooms and wet ground, and of course, the crackling sounds of leaves. Winter brings the smell of woodsmoke and the silence of snow. The language is simple, clear, effective and universally appealing. Swiss author Crausaz's background as a graphic designer is evident in her crisp, bright illustrations featuring a rosy-cheeked, pigtailed brunette little girl. Double-page spreads of the girl biting into a sandy peach, a nighttime silhouette of the garden, kids jumping in leaves, or a close-up of a mittened hand holding a snowball are all equally attractive. 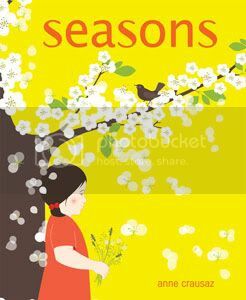 Of course, this book would be a natural in the classroom, for a unit on the senses, or the seasons, but it's simple beauty and evocative text would make for a lovely storytime read-aloud as well. This book is so gorgeous, and the writing so lyrical, I wish it was eligible for some kind of award! Sadly, it's foreign pedigree rules it out for the Caldecott, and the brevity of the text means it's not a contender for the Batchelder award either. Can we invent an award specifically for this book? Because it is definitely the-best-picturebook-this-year-that-you've-probably-never-heard-of-but-totally-need. Highly recommended.